If you think of a tarte tatin, people will conjure up images of deliciously sweet and syrupy apple desserts however think again! This tarte tatin is savoury, moreish and there’s not a single apple in sight. 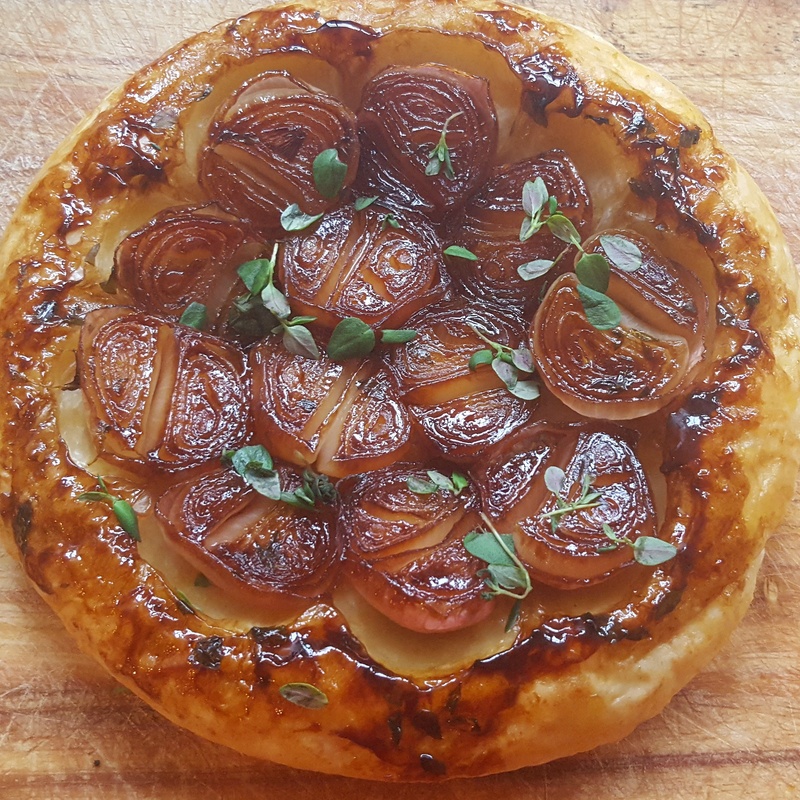 I have previously made an onion tarte tatin however you just can’t beat the softeness of the shallot with its gentle flavour which goes perfectly with the tartness of the balsamic and the savouriness of the pastry. Balsamic and thyme is a match made in heaven so I have included this in the caramel and also sprinkled some more leaves over the top to finish. I used normal shallots however banana shallot will also work well. Readymade puff pastry sheets tend to be quite large and may need cutting down. You will need to make sure the pastry round is slightly larger than the pan itself so the pastry can be tucked in snuggly. 1. Double check the instructions on the puff pastry you buy but otherwise preheat the oven to 200c/ 180 fan ready for action shortly. In the meantime, boil a kettle of water and pour into a heat proof bowl that is large enough to hold the shallots. Soak the shallots for 10 minutes before removing, allowing to cool and then peeling them. Carefully cut the shallots in half from end to end so they stay together as best as they can and set aside. 2. Take a frying pan that is around 22cm in diameter. Heat the butter, sugar and balsamic vinegar along with the leaves from several fresh thyme sprigs. Season lightly. Place the shallots cut side down in the pan. Cook on the hob over a low to medium heat until the shallots start to soften which will take around 10 minutes. Don’t be tempted to cook them on a high heat otherwise the balsamic mixture will burn. You will find the balsamic reduces down a bit which is what you want. 3. Take the puff pastry sheet and gently lay it across the top of the shallots. Tuck the sides in so they hug the shallots and cook in the oven for around 20 minutes until golden and cooked through. You can tell if it needs a little longer as pastry may look paler in places. When cooked, remove the pan from the oven and get ready to turn it out. Lay a board or serving plate across the top of the pan and turn it over. If the pastry needs a little hand then use a knife and run it around the edge to help loosen it. Be careful not to burn yourself on the hot pan or with the hot juices. If a shallot or two is stuck to the bottom of the pan, gently coax it off and pop back in its rightful place. Serve with a simple salad. Balsamic and thyme shallot tart tatin- a savoury twist on a French classic! This entry was posted in Recipes and tagged balsamic vinegar, pastry, puff pastry, savoury tart, shallot, tarte tatin, thyme by sotiris14. Bookmark the permalink.